Designed for heavier work loads the Aja-Kleen series is the big brother of the Migi-Kleen series. They are reliable system with an excellent track history for meeting production requirements for loads up to 2000 pounds. 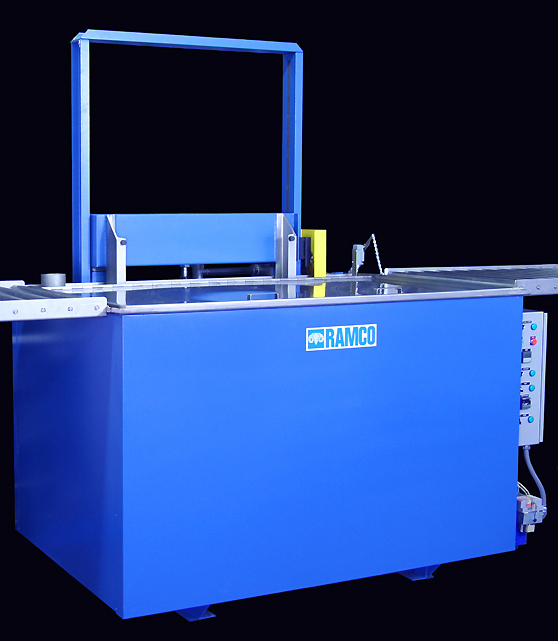 It is a heavy duty parts washers system. Standard features are the same as the Migi-Kleen series but the construction is heavy duty. 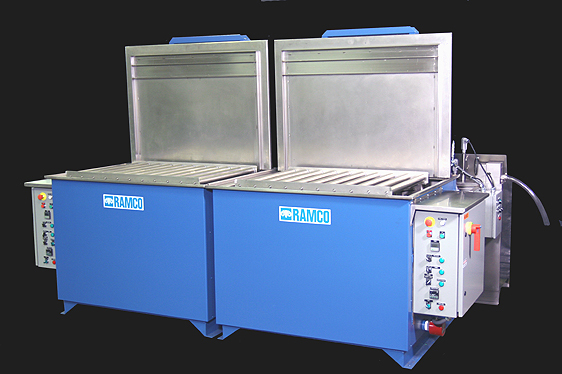 RAMCO Aja-Kleen Washers are without a doubt the most rugged mechanical agitation systems built. The construction is heavy gauge carbon (or type 304 stainless) steel. Each washer is made with a minimum 3/16″ plate rear wall, 3/16″ elevators and ten gauge construction elsewhere. The outer tank lip is flanged and raised to trap solution and minimize spillage onto exterior walls. Structural girths are provided around the perimeter of the tank and it is double welded in critical locations for added strength. The tank bottom is welded onto I beam. The rear wall, external structural angles and tank bottom are welded together to form a unitized fabrication that transfers load forces to the floor. This provides superior structural stability. The lowering and lifting method is engineered to put strength in and take stress out. The load is supported on a structural I beam elevator. It tracks on internal structural angles with large UHMW bearings or V groove casters (carbon steel systems). Roller bearings are mounted externally at critical locations to evenly distribute the load and eliminate all cylinder maintenance. The elevator will not jam. There is no worry about eccentric loading. There is no cylinder wear. Special “factory only” cylinders and components can become a problem in maintaining your machine. “Maintenance Kits” are often required to keep you up and running. 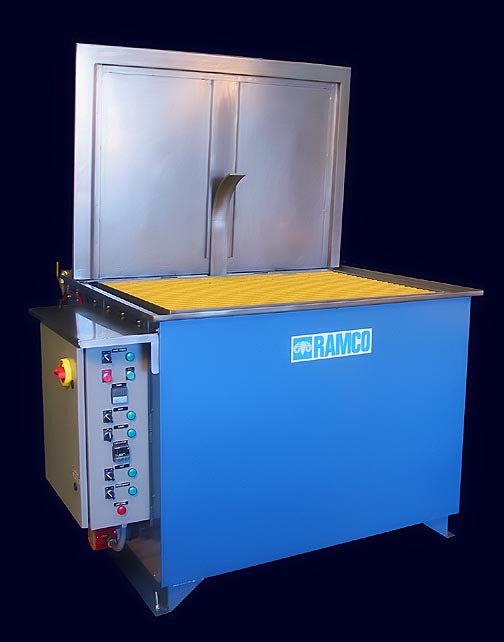 RAMCO uses only NFPA cylinders (National Fluid Power Association, an established industry recognized source of standards for pneumatic components) to provide the highest reliability and broad interchangeability with many standard industrial brands. Our design virtually eliminates cylinder wear for years of trouble free service. The cylinder is guaranteed for life. 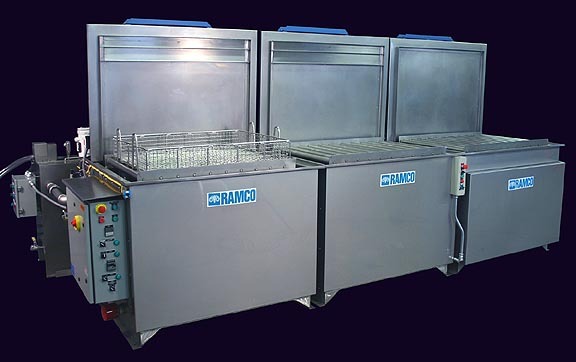 Built for reliability and versatility, the RAMCO pneumatic circuit is the best in the industry. Speed and stroke controls are variable with agitation speeds in excess of 250 strokes per minute. An air filter, regulator and lubricator is included with every system. The overall simplicity in design makes maintenance easy. The Aja-Kleen has the unique feature of combining variable lengths of stroke with variable speeds of stroke to create an infinite number of motion combinations to handle a variety of different cleaning problems. Manual (counter-balanced or spring loaded) covers left open result in loss of heat and chemical as well as increasing the chance of solution splashing out of the tank. Aja-Kleen Washers include automatic opening/closing covers on every unit for economy and to ensure safe operation. Heated Aja-Kleen systems are insulated. Digital indicating temperature controllers are standard on all heated systems. Every electrical panel has a 110 volt control circuit for safety. All electric heaters are type 316 stainless steel. Aja-Kleens easily abut to form multi-stage systems using minimal floor space. Specifications are available. Please request Catalog 200.